When you are starting a blog, you might get stuck on how to come up with a blog name. 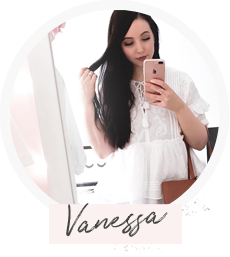 There are so many blog name ideas out there, however finding inspiration and discovering a name that’s right for you and your blog can take some time! Choosing a name for your blog is a very important step – the more time goes by, the more names are taken, web addresses are taken, and you really have to work to come up with one that is unique, short and catchy. If you’re stuck on what to name your blog, don’t worry. You’re not the first person! 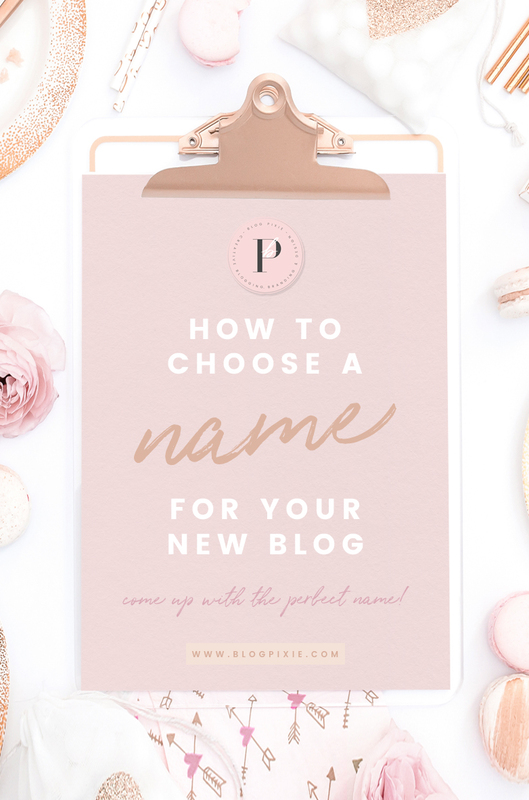 To make things easier for you, I want to show you how to choose a name for your blog and fill your mind with creative blog names so you can find the perfect one for your blog! The first step in naming your blog is knowing exactly what type of blog you’re creating. Will it be fashion? Beauty? Travel? 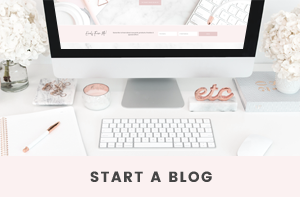 When choosing a blog name you need to have a strong focus on what your blog is going to be about, as your blog name will need to relate to that topic in some way. Your brand is another important factor in deciding on a blog name. A brand is a look, a feeling, a vibe and your tone voice. How do you want your visitors to see you and your blog? Do you want to look expensive and stylish? Would you rather look affordable and fun? What vibe do you want your blog to have? When you know what your brand is going to be about, you will have a better understanding of the types of words you should use in your blog name. You should also know what type of people you’re looking to target with your blog. For example, if you were creating a blog for female entrepreneurs in their 40s, you wouldn’t call your blog “Boss Babes 4ever”. Get what I mean? Now that you have an idea of what your blog is going to be about and the vibe you want to create with it, you’ll need to start brainstorming words. You need to create a list of every word you can think of that relates to you and your niche. For example, if your niche is Fashion, you could write down words like “chic, dress, love, stylish, stylist, outfit, diary, look, design, sketch, show” etc. Then to have even more options, I suggest writing down words that describe you, such as “girl, happy, strong, energy, woman, desire, dream” etc. When I’m trying to name something, Thesaurus.com is my best friend. You can use their website to type a word (relating to your niche) into the search box and they will bring up lists of so many relevant words that you can add to your brainstorming list. Now that you have your big list of words, you need to start mixing and matching them. You will need to come up with a new list of potential blog names that you can choose from. Unless you make up a brand new word, your blog’s name is most likely going to need to be more than one word. If you need to, add a word at the start or middle, such as “the”, “and”, “with” or “to”. You might come up with names like “Classy And Chic”, “Desire The Dress”, “The Style Sketcher”, etc. If you’re really struggling with mixing words and coming up with creative name ideas for your blog, always remember that you can use your own name! If you plan to run your own business and you want to be the face of it, going with www.yourname.com is actually a really smart idea! 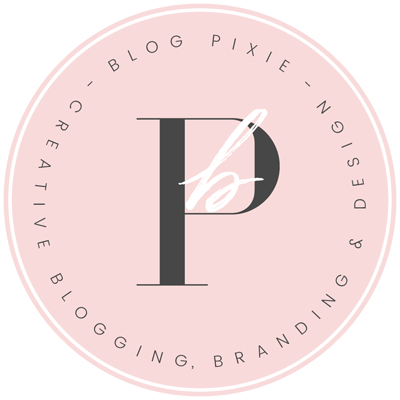 Once you have your list of potential blog names, you need to check what’s available. You have to make sure the domain name (www.yourblogname.com) is available and not being used by someone already. Your web address is so important, as it’s how your readers will visit your blog. It needs to be short, memorable and unqiue. 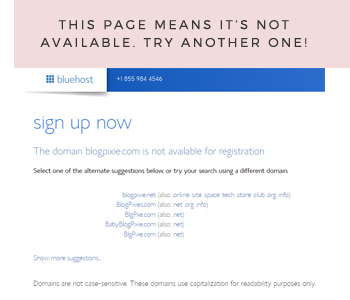 When you click the green ‘check availability’ button above, it will either take you to a page that says it’s not available, OR it will take you to a page to create your blog hosting account (which means it’s free and ready to go!). If your desired domain name is available, get it as soon as you can! 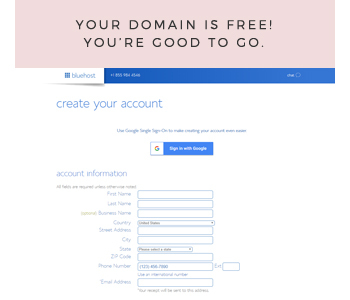 When you purchase your blog hosting with Bluehost, they will include your domain for free so you don’t have to purchase it separately anywhere else and it will automatically be connected to your new blog/website. More and more domains are being snapped up every day (people even buy them just to re-sell) so if you can get your domain, snap it up before someone else does. I hope you now have a brand new blog name and you’ve secured the domain name to match! Jump back to find out more information on how to start a blog.